The suburban village of Pancharevo is a place for a weekend getaway. Here the Iskar Dam (Bulgaria’s largest artificial lake), Lake Pancharevo, and the Pasarel Reservoir provide opportunities for fishing, camping, and boating. There are also many hot mineral springs near the lake. Panacharevo's attractions include the ruins of the medieval Urvich fortress, and a number of old monasteries and chapels. 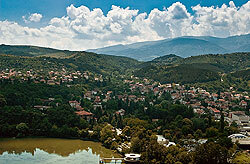 Composed of 10 villages, Pancharevo is Sofia’s largest municipality.